Though Californians think of wildfires as the main threat to their homes, electrical outlet fires and fires caused by other electrical equipment actually burnt more acres than wildfires did in 2015. Plus, an electrical fire in the home is often a more immediate danger than a wildfire and may lead to panic. The first thing to remember is that you need to stay calm. Then, follow these steps to put out an electrical fire at home. The Federal Emergency Management Agency (FEMA) advises that, in the event of a fire, the first thing a homeowner should do is call the fire department. Yes, you can put out small fires by yourself, but there’s always a chance that you will fail. If you do, you want the fire department to already be on the way, so that they can put out the fire as quickly as possible. In fact, even if you have put out an electrical fire, there is always a chance it could re-ignite. When they arrive, the firefighters will ensure that the fire is truly out and that your home is safe. You’ve called 911, and the fire is still raging, so take a split second to gauge your safety and your family member’s safety. If a child, senior, or someone with mobility issues is nearby the fire, evacuate them first. If you are panicking, you will not make the best decisions for your safety. It’s okay to recognize that the fire is more than you can handle, just evacuate. What if You Don’t Have a Fire Extinguisher? Fighting an electrical fire without a fire extinguisher is particularly dangerous because we reach for water instinctively to put out fires, but water will make an electrical fire more dangerous. If you try to use water, you may even electrocute yourself. 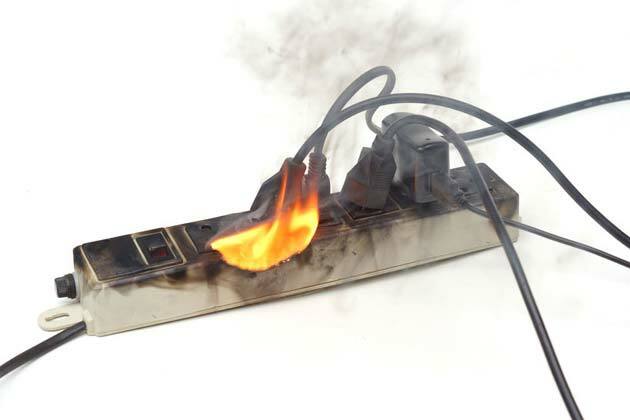 Instead, you first need to turn off the power to the electrical outlet or device that is on fire. It may not be safe to do this without a fire fighter’s equipment. But, if you are certain it is safe, you may flip the main breaker in the electrical outlet (it’s a larger breaker) which cuts power to the whole house. Once the power has been cut off, the fire can be doused like a normal fire, with water or an “A” rated fire extinguisher. If your home has been damaged by an electrical fire, all you need to do is make a single call to TSC Restoration. We file the claim with your insurance carrier, handle damage removal, fix damage including from smoke, clean the debris, and fully restore your home. Contact us at TSC Restoration today, we are available 24/7 to help. This entry was posted in Fire, How to Guides, Safety on September 27, 2018 by TSC Restoration.